I was lucky enough to see Paul Hallas lecture at the Cambridge Pentacle Club the other night (6/7/2004), and it was a real treat. This was Paul's penultimate lecture in the UK before he disappears off to the United States, and so I feel very privileged to have seen it. I have seen many lectures in the last few years and I can quite honestly say that this was one of the best. Paul started by describing himself not as a magician, or mentalist but rather as an Alternative Psychological Entertainer. What a great line. Immediately we knew that we were in for an evening of humour, magic and mystery. It was abundantly clear from the outset that Paul Hallas is a very polished and experience performer. In some ways he reminded me a little bit of Richard Osterlind in that he has a very relaxed persona. However, by saying that I would not be doing him justice if I didn't add that he has a great style all of his own. Maybe it's the soothing Yorkshire accent, or the enigmatic smile that makes you never quite sure whether he is being serious or not, but either way he is a very entertaining fellow. The entire lecture was jam packed with little gems and subtleties that made the world of the difference. Even if he hadn't explained any of his effects there was much to be learnt just by listening to the patter and watching his presentation. Added to all this, his knowledge of the origin of the various effects, moves, counts etc. was astonishing, and just highlighted how much of an expert he really is in the Magic Community. At the break Paul spent most of his time demonstrating packet tricks, which should really come as no surprise as many will know that he has written a book called "Small but Deadly", which is perhaps the definitive bible on packet tricks. Sadly this book is out of print at the moment (BooHoo), but happily it will soon be republished by H&R Books in Humble Texas (WooHoo!). Incidentally I managed to find a copy from “Magic Books By Post”, so if you look they are still available. I won't describe all the effects Paul did as I feel that that would indicate that the lecture was little more than a series of routines and explanations, and in reality it was so much more than that. However, here are a few of my favourites just so you get a flavour of the evening. A velvet bag containing a prediction is laid out on the table. A deck of 50 numbered cards are shown, and the backs are shown to demonstrate that on the back of each one is written the name of a different item of food. A number is selected by a spectator and the item on the back of the relevant card is found to be in the bag. The method many will recognise just from the description, however for me that wasn't important. It was the presentation of this effect that made it so special for me, and although it was something I haven't used in the past, it will be something that I will be using in the future. Two spectators are asked to help. The first cuts about a third off of the deck and places the pile in front of him. The second then cuts the remaining pile. The second spectator's cards have been cut from the middle of the deck, and so all has been very fair. The second spectator peeks the top card, remembers it and then shuffles his portion of the deck. The magician then asks that the first spectator shuffles his packet of cards too. When the second spectator is happy with the shuffle, he is asked to peek the top card. The deck is reassembled and the magician proceeds to try and divine the two selected cards. The first spectator's card causes a problem, but after a little by play the second spectator's card is determined. Back to spectator number one. Again the magician tries to read the card, and again can't quite see it, so he suggests finding it with another method. He holds his hands over the top of the deck and concentrates on the energy that rises up from the cards. He then looks the spectator squarely in the eyes and says with confidence the exact position in the deck of the spectators card. The cards are counted out and sure enough the card is exactly where it was suggested. I really loved this effect, apart from anything else it was so self working that all you really need to do is to concentrate on the patter. The presentation though is important and really made this effect stand out for me. A spectator takes a coin and flips it in the air. 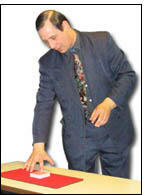 The magician clearly demonstrates that he predicted correctly whether it was heads or tails. Doesn't sound much does it? but it was so much more than just that. Let me explain. Firstly the workings of the prediction was explained, and Paul showed how the principle could easily be adapted to work in many different effects. However, with that being said, I liked it very much for exactly what it is. A very simple 50/50 chance prediction. As the title suggest used in this way it works brilliant as an opener for a short mentalism act. Just imagine, you start off my predicting the flip of a coin. A 50/50 chance. You then move on to demonstrate a slightly more complex prediction. Maybe a one in 5 chance of guessing a selected ESP card ("Especially Wild" for example) or a 1 in 6 chance on guessing the side of a die ("Die Cipher2" for example). And then finally the ultimate, a 1 in 52 chance of guessing a thought of card (too many examples to choose from, but if nothing else, an invisible deck works well). So for me the 50/50 opener is brilliant. The principle is just an added bonus. It's a sad loss for British Magic that Paul won't be giving so many lectures in the UK. Hopefully he will still fly back for the odd one though, and if you get a chance, don't even think twice about it. And finally I would like to mention that at one point Paul gave his interpretation of "twisting the Aces", demonstrating how powerful this routine can actually be. I have seen "Twisting the Aces" performed numerous times before, often in such away that it just makes the magician appear to be showing off. When Paul Hallas does it he is demonstrating magic.